When most people see LaGrange Police Sgt. Johnny Byrd, he is proudly wearing his badge and department uniform. Byrd often conducts informal meetings with various organizations in the community and formal meetings alongside Public Safety Chief Lou Dekmar. He also enforces the law and helps crack down on code violations in the city limits. 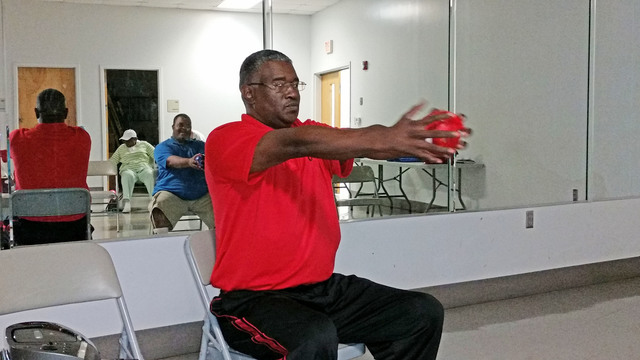 But there are a few who see another side of Byrd — the man who shows up in gym pants, a T-shirt and tennis shoes twice a week to the Mike Daniel Recreation Center on Lafayette Parkway carrying bags of exercise equipment and ready to work up a sweat. Byrd teaches a class called Opening Doors, a low-impact exercise session that helps folks living with conditions like multiple sclerosis, cerebral palsy or recovering from a stroke. The group of 23 people, which is filled with men and women of all ages, work every muscle group alongside Byrd, executing arm curls, chair sit ups, squats, and hip and shoulder rotations, among other exercises. The class uses light-weight exercise balls, stretch bands and even the back of the chair they are sitting in during the session. “The class gives all of us something we can handle, even if we have a partial handicap, and the instructor is very understanding,” said Pat Horton. “And we will, slowly but surely,” Byrd assured him.